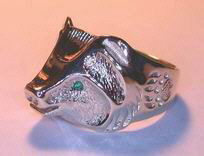 Cast Rings – From wax to gold, silver or platinum casting by Bearclaw Native American Indian Jewelry. Cast then detailed and hand engraved. Wedding rings engagement rings friendship rings or just finger art they will be a one-of-a-kind ring. The cost on cast items varies depending on weight and gem stones. It will generally be from 6 grams to 15 grams and $500 to $900 . Finger size and karat content are also factors. 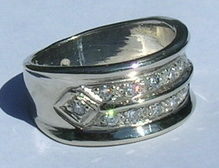 The rings shown of the left are 2 of the more ‘ heftier’ ones. Cast items are generally heavier but thin and delicate designs are available. The Casting process , costs and the material costs are very much out of my hands during some of the operations. If I don’t already have the mold made I start with a special hard wax that is a composite of paraffin wax and plastic, among other elements. I carve the item much like someone would carve a statue or mask from wood, only my tools are small burr bits on the end of a Dremel tool or small pointed and rounded spatula’s and knife shaped tools much like miniaturized kitchen utensils. After verification from you I ship it to my casting guy and his automated and temperature controlled oven casts an exact replica of the wax, in silver or gold or platinum. His cost for this procedure , the material cost and the shipping there and back are beyond my control. My labor cost and for detailing is added on depending on the amount of work required.